It’s not unlike any other accelerator that you’ve probably seen before, but Nashville, Tennessee’s Jumpstart Foundry has a lot riding on its success. The TechStars Network accelerator is graduating its first 6 startups on today’s Demo Day and they all show signs of being on the path to greatness. I had the chance to sit down with founders from all six yesterday, to talk to them about what they’re doing and the challenges that they’ve faced. 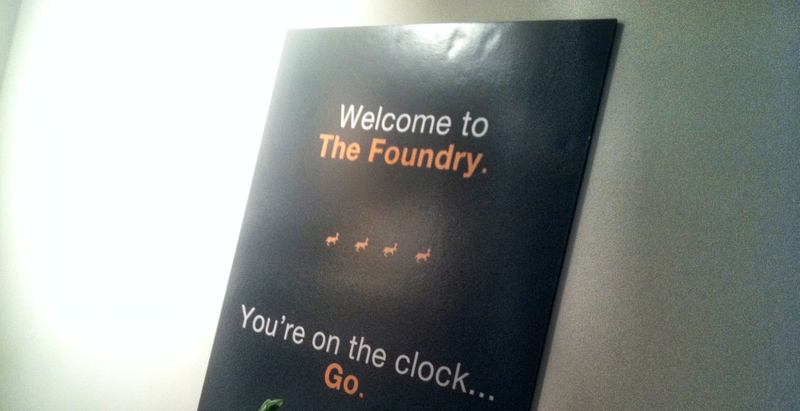 We’ll be doing more in-depth pieces on each of them soon, but here’s an overview of what investors, press and other interested parties will see coming out of Nashville’s JumpStart Foundry today. GoodJob – GoodJob is a platform to provide fast, mobile, on-the-spot employee assessment to help facilitate retention. It’s specicially tailored for the fast food industry where turnover is in excess of 123%. The founders state that the loss of 1 employee can lead to $2,000 in lost money for a restaurant. If that employee is management, then the loss can be closer to $15,000. In an industry where there are over 220,000 quick service restaurants in the United States alone, improving retention by even 1% would make a huge financial impact. Meevl – Founded by two Slovakians who moved to the US just for Jumpstart Foundry, Meevl is a social media management platform that has been turned around to work instead of employee retention. Something great happened in your company? Meevl lets you tell the world about it, while keeping powerful statistics about what’s going on. The company started as a social media dashboard, but took the turn to being an employee satisfaction platform early in the Jumpstart Foundry instruction. Daio – You’re developing mobile apps, and you need to be able to show them off as you’re working on them. Instead of having to tote around a full computer, Daio lets you design and build mobile applications on a tablet. It’s already released, in beta, on the Android Market and should be coming for the iPad within the next 60 days. One of the founders tells me that the biggest facepalm moment for Daio was realizing that their already-built platform for doing mobile apps via the desktop was not at all what the customers wanted. Kahootzz – Kahootzz is a mobile application that learns your interests. Every day, it delivers a personalized, short list of recommendations for work, play and social good in your city. It’s iPhone-only for now, with an Android and Windows Phone app planned for the fall. It will start in Nashville, targeting college campuses, then continue its roll-out to other areas in January. Cold Crate – If there’s one thing that’s huge in Nashville outside of music, it’s medicine. Every year, hundreds of millions of dollars are spent in transporting biomedical and pharmaceutical items in cold storage. The systems that exist today are inaccurate and there have been next to no advances in the systems for the past 5 years. Cold Crate is a new solution that keeps temperatures within 1 degree of ideal, it saves money and lasts 14 days instead of 2. RentStuff – You have stuff, and you could make money by renting out your stuff. At present there’s no platform that will allow you to do it safely, with security deposits just in case your stuff gets broken. RentStuff fixes that problem, providing a mobile-driven platform where you can find, list, rent and even pay all from your phone. The team has learned a lot from the recent Airbnb fiasco, as well as by looking at other potential players in the space. For now, it’s live and you can look around to see if you can rent stuff in your neck of the woods.